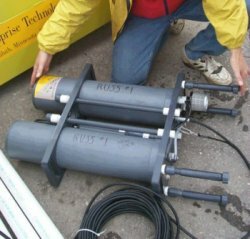 RUSS (Remote Underwater Sampling Station) was introduced by Apprise Technologies, Inc. in 1997. An on-board 386 or 486-based CPU coupled with a communication module provides for remote control, operation of the leveling device, and data acquisition and transfer. The unit is powered by deep-cycle cell batteries that are recharged by solar cells. Buoyancy compensation technology is used to move a sensor package up and down the water column; this system can take samples at up to 27 m depths, with a precision of 0.2 m of the requested depth. (Deep water designs for RUSS have a max. depth of 100 meters with an accuracy of 0.2 meters of requested depth.) 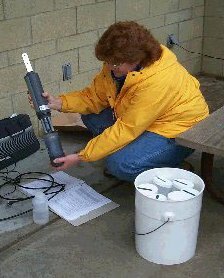 The RUSS units are thus able to provide real-time water quality data at user-specified sampling intervals, virtually independent of lake conditions (Betts, 1998; Water Environment Federation, 1997). The RUSS units sample five critical water quality parameters: temperature, pH, dissolved oxygen, conductivity, and turbidity. Some units also have achlorophyll sensor for directly estimating algal biomass. The only effective time limitations to sampling frequencies are the times required for the sensor unit to descend to a specified depth and for the individual sensors to equilibrate. In reality, the relevance of the data is specific to the event being sampled; turbidity might be relevant on a daily basis, whereas oxygen profiles may change hourly. The precise sampling frequency will therefore depend on the question being asked. The RUSS unit has been initially programmed to collect 1 m interval profiles at ~4 hour intervals seven days per week. Additional event-specific sampling will be programmed by NRRI to collect information relevant to the time-scale of non-point source pollution. This may involve continuous monitoring at a single depth before, during and after a storm, or via intensive profiles at ~ 1 hour frequencies. For more information on how we are dealing with quality assurance, view our QA/QC. A PDF version of the RUSS parameters is available (warning: 1.6 Mb file). You'll need Acrobat Reader installed to view this file.